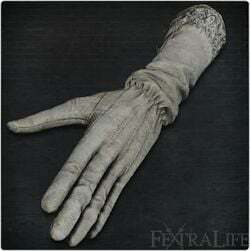 "White surgical gloves. The intricate embroidery weaves a spell that protects their wearer. The Church engages in the hunt in a medical capacity. When a cancer is discovered, one must pinpoint its location, reach in, and wrench it from the host's bosom." Buy the Hunter Chief Emblem to gain access to the Grand Cathedral's round plaza in Cathedral Ward. That is the locked gate up the stairs past the first Reaper. From the door, go left, past the enemy with the Flamesprayer, and to an alley where several enemies will attack you as you talk to NPCs in windows. The Set is in a corpse. The description&apos;s last line sounds like a visceral attack, anyone test to see if it has any effect?